Philips takes aim at OLED, says 3D TV is dead | What Hi-Fi? 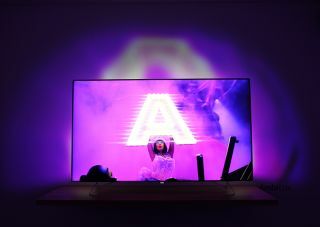 Philips couldn’t care less about 3D and is planning to beat LG at its own OLED game - that's the surprisingly forthright verdict from the launch of the company's 2016 TV line-up. The new range comprises HD and 4K TVs with LED panels, but Philips also has big plans for OLED. So says Danny Tack, Philips’ director of product strategy and planning, and all-round picture quality guru. “We all know what OLED is good at. The right blacks, the right brights. It doesn’t have a problem with halos. OLED is also good in motion. The sharpness is better. The motion is better," said Tack. The strengths of OLED are well documented, but so are the associated costs. It was only recently that buying OLED became a viable option, and Philips intends to take advantage of this. What about LG? It dominates the OLED sector, and Philips will need to do a lot to beat LG at its own game. The first move is to use LG’s own tech, but improve it. As for curved versus flat screens, it’s an easy question for Tack. Philips is currently focusing on a 55in model for the European market. Availability? Tack wouldn’t say anything besides “come to IFA”. September 2016 it is, then. Elsewhere, it’s bad news if you’re a fan of 3D TV, because none of the 2016 range will have it. Philips has officially given up on the technology.